Many broadcast and production studios have already implemented, or are in the process of implementing, Audio over IP (AoIP) solutions to distribute digital audio across their facilities, including intercom systems. AoIP-based intercoms do of course offer the native advantages of networked audio and standards-based protocols such as AES67, but the presence of a matrix at the center of the system has, until very recently, perpetuated inherent scalability limitations. Any matrix-based intercom system, regardless of how the audio is distributed, still has a finite amount of I/O and a crosspoint count that cannot be exceeded without incurring costly changes to the core infrastructure. In such matrix-based intercom systems, adding more endpoints reduces the number of remaining available ports. This limits the almost inevitable system changes and expansions required down the road. To overcome these limitations, Telos developed the Telos Infinity™ IP Intercom, a revolutionary design that eliminates the central matrix and employs a system of distributed processing. As a result, adding more panels to the system actually adds more resources. Being AES67 Livewire+ compliant, Telos Infinity natively enjoys the expected benefits of an AoIP system, including reduced cabling. As a rule, a single Ethernet cable connected to a network switch is all that is needed to tie any intercom endpoint or other audio device into the system where it becomes a shared resource. Unlike matrix-based systems, there is no need to run cables from new endpoints back to the central matrix when expanding the system, which reduces the costs and disruptions typically associated with system growth. Infinity’s easy-to-use Dashboard software makes configuring the additional hardware fast and straightforward. Being AES67 Livewire+ compliant also means Telos Infinity IP Intercom integrates seamlessly with the thousands of products from over 100 Livewire partners that support the AES67 standard, and by extension, the SMPTE 2110-30 Media over IP interoperability standard. 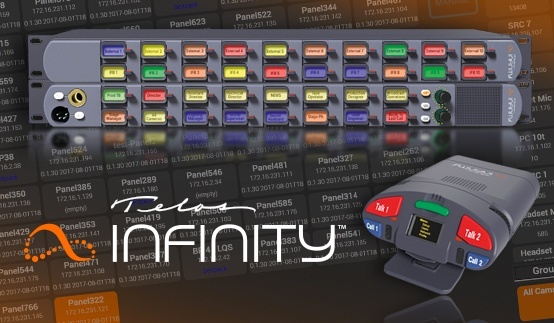 Audio interfaces such as the Telos Alliance xNodes facilitate integration with incumbent hardware including intercom systems, mixing consoles, and other ancillary equipment. This makes Telos Infinity IP Intercom appealing not only for new, ground-up installations, but for users looking for a way to migrate to AoIP incrementally as time and budget permit.